Buy Belliric Myrobalan (Terminalia Bellerica) Raw Herbs - Relieves blocked phlegm,Premature graying of hair,loss of appetite, flatulence, thirst, piles and worms. Botanical Name : Terminalia bellerica ROXB. Tamil Name : Kalanduri, Kalitturumam, Kandugamsadagam, Sirottam, Tanni, Tanri, Tanrikkai, Tanikkay, Tanrik-kay, Thanika, Tanrikkay, Aramam, Akkantam, Akkattan, Aksam, Amutam, Catakam, Erikatpalam, Kalantunri. Common Name : Belliric myrobalan, Beleric, Baehra. Sanskrit Name : Akasha, Aksa, Aksah, Aksaka, Aksha, Anilaghnaka, Baheduka, Baheruha, Baheruka, Bahira, Bahuvirya, Behedakah, Bhuta-vasah, Bhutavasa, Bibhita, Bibhitaka, Bibhitakah, Bibhitaki, Harya, Kali, Kalidruma, Kalidrumah, Kaligrvamah, Kalinda, Kalivriksha, Kaliyugalaya, Kalkidharmaghrah, Kalpavriksha, Karsaphala, Karsaphalah, Karshapalah, Karshaphala, Kasaghna, Kushika, Mrgalindaka, Samvartaki. Hindi Name : Bahera, Baheda, Behara, Behra, Bh-airah, Bhaira, Bhairach, Bharla, Bhera, Buhura, Bulla, Sagona, Bh-aira, Bahirda, Vibhitaka, Behera, Banera, Veda, Deshi-badam. Malayalam Name : Tani, Tanni, Tannikai, Tannikka, Tusham, Thare, Thani, Thaanni, Adamarutha. Kannada Name : Behara, Santikayi, Shanti-mara, Tanrikai, Tari, Tari-kayi, Tnrikayi, Thani, Aakaashamara, Shaanthi mara, Thaaremara, Tharimara, Santi. Telgu Name : Bhutavasamu tadi, Kattu-olupoe, Tadi, Tandi, Tandikaya, Tandra, Tandra-kaya, Tani, Thana, Thandra, Vibhitakamu, Thadi. Marathi Name : Beheda, Beda, Berda, Bherda, Baheda, Bahera, Sagwan, Yehela behada, Baira, Balra, Beharda, Behasa, Bhirda, Hela, Goting, Vavara, Vela, Yehelabehada, Yela, Gotimg. Bengali Name : Buhuru, Boyra, Bohora, Bohera, Bhairach, Behera, Bahura, Bahira, Baheri, Bahera, Lopong. 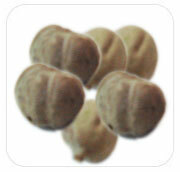 Health Benefits of Belliric Myrobalan: The fruit possesses antibacterial properties. It is used in dropsy, piles and diarrhea. It has a strong purgative action. It can expel stones or other mucus type accumulations in the digestive, urinary, circulatory and respiratory tracts. It is also a strong rejuvenator of the body, especially for the voice, vision and hair. Recent research shows that Terminalia Belerica reduces levels of lipids throughout the body and specifically lowers the lipid levels in the liver and heart. This shows a strong action in preventing heart and liver fat congestion, which can lower the disease risk associated with those organs. Other studies indicate that Terminalia Belerica has retroviral actions in inhibiting the viral growth in leukemia patients, and yet another study indicates the strong inhibiting effect Terminalia Belerica has on the HIV virus. As a daily rejuvenating and preventative supplement Terminalia Belerica is superb. Terminalia belerica is a recommended daily supplement, alone or in the triphala formula. General Uses Of Terminalia Belerica: For thousands of years Indians and Asians alike have used Terminalia Belerica for its tonic effects. Terminalia Belerica is a large decidious tree that is widely known for its unique laxative and astringent qualities, so that as it purges the bowels it also tones the tissues of the digestive tract. It is an ingredient in Triphala and has rejuvenating, cardio-protective, antacid, antioxidant, and antibacterial properties. Terminalia Belerica Uses & Scientific Evidence In addition, to having laxative and astringent properties, recent scientific studies have shown Terminalia Belerica to be a powerful adaptogen. An adaptogen is a hypothetical treatment or prescription for health. A healthy lifestyle is the one indisputable example of an adaptogen. Eating right, exercising, and doing all things in moderation will help the body adapt to stresses such as heat, cold, exertion, trauma, sleep deprivation, toxic exposure, radiation, infection, or psychological stress. There are no side effects with an adaptogen. It must be able to treat a variety of illnesses and help an organism return to its balanced state no matter what the cause. Further scientific studies have shown that Terminalia Belerica lowers lipid levels in the liver and heart, and works well in preventing heart and liver fat congestion, which lowers the risk of disease associated with those organs. Preliminary studies have shown its effectiveness in inhibiting viral growth in leukemia patients, and other studies are showing promise in Terminalia Belerica’s ability to hinder the spread of the HIV virus. Terminalia Belerica Dosage:Terminalia Belerica can be used everyday for overall health. It comes in various forms and is an ingredient in many products. For best results, read and follow product label directions. Terminalia Belerica Safety & Interaction: Terminalia Belerica is generally regarded as safe for everyday consumption. There are no known safety issues or interactions associated with using this supplement. If you are taking any other supplements or medications, it is best to seek the advice of your physician before using Terminalia Belerica.